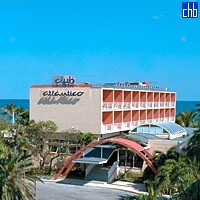 If you are looking for a beach resort to explore Havana from & thus enjoy both a sightseeing & beach holiday, Club Atlantico is a great low-cost choice. Convenience is a byword at Club Atlantico, with the hotel located on the stunning Santa Maria Beach, so guests can have their toes in the ocean seconds after leaving their rooms. The numerous chairs & umbrellas on the beach outside the hotel are also free of charge. Of great convenience also is the free air-conditioned shuttle service to central Havana, which is just 20 minutes away (book a day in advance to avoid disappointment). 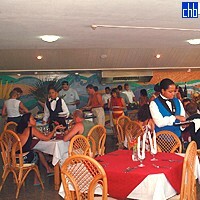 Club Atlantico has 2 a la carte restaurants, a buffet restaurant & a snack bar, as well as a pool & lobby bar (open 24 hours). The hotel serves a good standard of food & drink throughout the day & the pool/beach bar conveniently serves both, so you never need to leave your sun lounger. 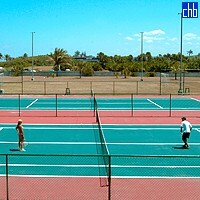 More active guests may wish to make use of the large swimming pool (which has a children's play area), beach watersports, tennis courts & the gym. 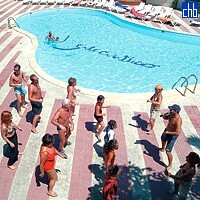 There is also daytime entertainment around the pool, though the friendly entertainment staff are never pushy, so guests can relax or take part at their leisure. The staff also put a lot of effort into the entertaining evening shows. While not a new hotel & needing modest refurbishment, Club Atlantico still provides 4-star service & facilities, delivered with warmth, enthusiasm & friendliness. 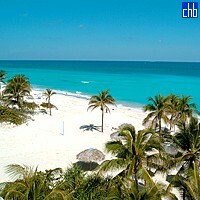 But most memorable of all, the hotel has great access to one of Cuba’s most impressive beaches. 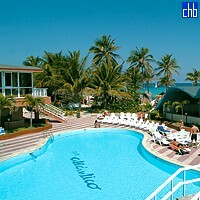 Hotel Atlantico was previously known as Hoteles C Club Atlantico. All rooms are spacious, clean & quiet with great views (especially those with beach views on the second & third floors of the east side of the building). 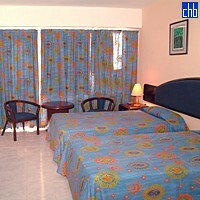 All rooms have twin or kingsize beds, bathroom (with shower), good air conditioning & balcony or terrace. 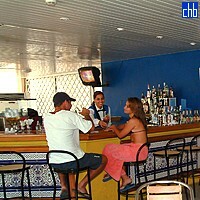 The Standard Ocean View at Hotel Atlantico are very similar to the standard rooms and have an enchanting view on the ocean and the beaches of Playas del Este. Plaže istočno od Havane su poznate pod imenom Playas del Este. Nalaze se na oko 20 minuta vožnje od centra prestonice i to su (od zapada prema istoku): plaža Bakuranao, plaža Tarara, El Megano plaža, plaža Santa Maria del Mar, Boka Siega plaža, plaža Guanabo, plaža Veneciana i plaža Rinkon. Sve skupa možete izabrati sedam kilometara obale prepune belog peska. Plaža Bakuranao je najbliža gradu, preciznije, nalazi se u Selimaru, četvrti istočne Havane. Nedaleko od plaže žubori potok istog imena – Bakuranao – sa svežom vodom. Turista neće lako naći ovu plažu, inače popularnu medju stanovnicima Havane. Plaža Santa Maria del Mar je prijatno, ne previše turističko mesto koje je vikendom prepuno lokalnog stanovništva Havana. Na njenom belom pesku možete naći sijaset koralnih ostataka i školjki. More je kristalno čisto sa nijansama zelenog i plavog. U moru je predivan pejzaž koralnih grebena, školjki i živopisno išarane ribe. Prijatna je uspomena svakog ko je zaronio u ove vode. Plaža Guanabo se nalazi u malom gradiću istog imena, takoreći predgradja Havane. Obala je prekrasna s vrlo dinamičnim noćnim životom.